The exit station accepts the tire from the test station, positions it for marking, and applies the high point or grade mark if an optional marker is installed. This item includes a manually operated drop gate that permits easy and comprehensive access to the test station for rim change, tire setup, and periodic maintenance. AkroMARK Plus™ is a multiple color and multiple shape hot stamp marking system designed to provide accurate tire marking associated with final finish testing. This product is capable of tire marking on a variety of tires, ranging from low profile passenger tires to medium truck tires. AkroMARK PLUS™ is available with Tire Orientation. 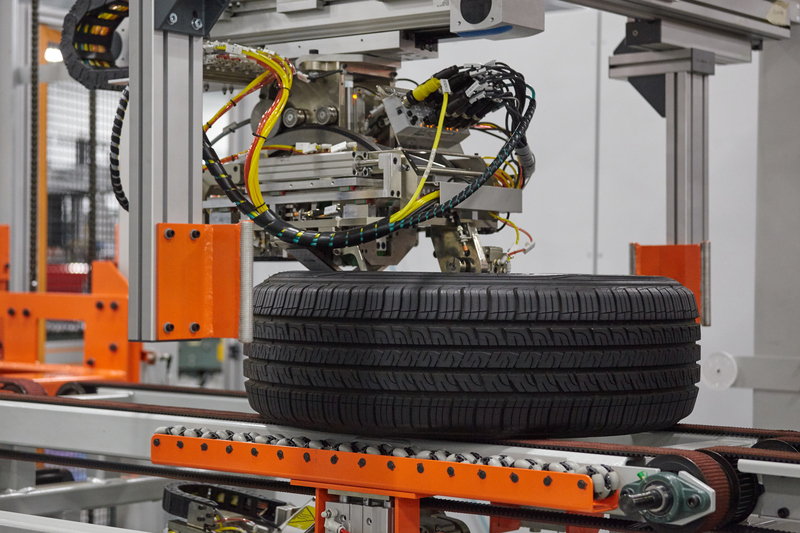 This key feature enables the tire to be rotated directly on the tire marking station, orienting the tire to be marked at specific locations. Marking is done for both upper and lower planes and for multiple marks on either plane. Micro-Poise® Product platforms may be integrated with third party markers. For any custom marking requirement please contact us.